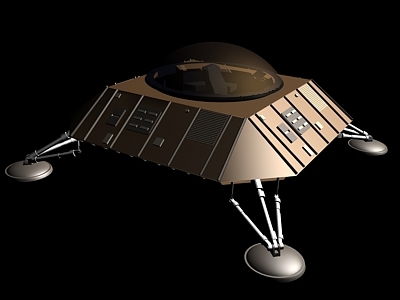 The Void Spider is a shuttle variant of the popular TX-3, large enough to carry four people along with a fair amount of cargo. It boasts a clear dome-shaped fuselage cover that allows complete viewing of the surrounding area. With directional repulsors located at the end of its landing struts, the Void Spider is capable of rapid deceleration and turning. Using the repulsors, a dexterous pilot can slip the Void Spider onto its side to fit through tight spaces. It is favored for civilian scouting missions since its lack of armament often causes it to be ignored by authorities, and the combination of speed, maneuverability and a sturdy hull allows it to escape mercenaries.